Latency-sensitive data distribution and media streaming is a part of many network-centric applications. Based on our previous practical experiences with interactive high-quality media distribution and orchestration of network-centric collaborative environments, we have developed an automated planner for media stream distribution in environments where bandwidth of streams is comparable to capacities of network links. We have successfully adopted methods of constraint programming to deal with this problem. We provide a new comprehensive description of the constraint model which builds upon basic algebraic description we have published earlier. To formulate the model, a tree placement problem is proposed and a new corresponding variant of the link-based model for traffic placement problem is applied. 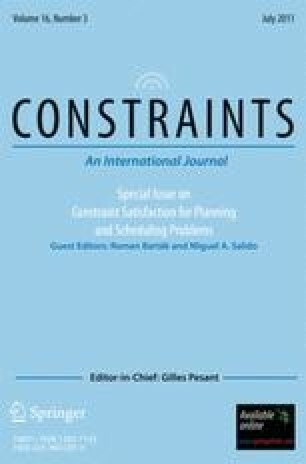 We prove correctness of the proposed constraint satisfaction problem to present validity of included constraints with respect to the desired functionality of planning. An evaluation of the implemented solver is presented on a number of experimental problems to show effectiveness of the formulation. Importantly, the solver is a part of an application middleware called CoUniverse, which is pioneering orchestration of component-based interactive collaborative environments in a number of global demonstrations and projects. Both flexibility of the described model as well as generality of other parts of the CoUniverse framework allowed it to be one of very few early adopters of bandwidth-on-demand services for advanced high-bandwidth applications. Goetz, B. (2004). Java theory and practice: Dynamic compilation and performance measurement. http://www.ibm.com/developerworks/library/j-jtp12214/.